This week I finally got around to tasting Volume II of the “Pitijopos”. Pitijopos is literally the Jerez/Sanlucar word for mayflies but here it is the name given to a boxed set of six “mostos”, or palomino wines (even if, confusingly it is also a term given to unfermented grape juice elsewhere in Spain ) from different vineyards in the Jerez region. The vines are all tended and harvested, by hand, by Ramiro Ibañez of Cota 45. Then each of the six wines is fermented at ambient temperature in wooden “butts”, where they stay for a good few months (unless I am mistaken 9 or 10) before being released as part of a set of six. The whole exercise is designed to show the influence that the terroir can have on the wines, and in doing so also demonstrate that far from being “neutral” as many suppose, palomino can be as expressive as any other great white grape. It really is a fantastic project and just a small part of the work that Ramiro Ibañez is doing on behalf of winemaking in Jerez and, his hometown, Sanlucar (amongst other things, he is writing a winemakers history of the wines of Jerez and Sanlucar, which looks like being a fascinating retake on the traditional, bodega centric vision). The first Volume of the Pitijopos, “From North to South”, was produced in 2015 and involved mostos from six different locations right across the Jerez region, from Northwest to Southeast: Trebujena, Sanlúcar, Rota, Jerez (Añina and Macharnudo) and Chiclana. The wines were strikingly different and fascinatingly so (you can see my reports on the initial tasting in this note – and then on the same wines after further study in this one). In fact, even without the chance to taste six at a time there is a clear benefit to tasting these mostos, since it can give you a look at characteristics of the base wines that the biological and other ageing processes obscure – the difference between Añina and Macharnudo, two pagos (vineyard clusters) that face each other across the Sanlucar road – is memorable. So I was really looking forward to Volume II. “Atlantico vs Guadalquivir”, and it didn’t disappoint. This time all six wines are from pagos around Sanlucar. As a result there was a more evident unifying style to the wines, and if I had to choose I would say Volume II had the edge on Volume I in overall quality, but again the differences, even between wines from only a few kilometres apart, were striking. 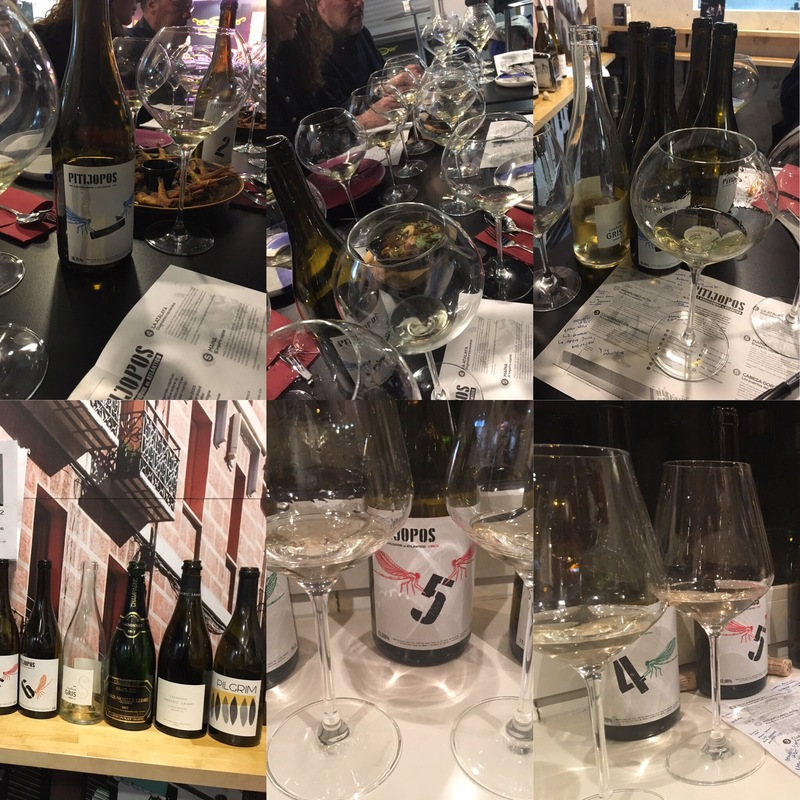 I posted a full note of this week’s tasting (from my heavily hungover state) on Thursday (although I still have a little bit left and don’t rule out writing a bit more at a later date). Overall it really is a fantastic effort by the winemaker (and the word here is effort, just think of the work involved in making six different wines like this) and two of the most educational, instructive tastings of my life (can you imagine having the opportunity to taste something similar from Pomerol or the Còte D’Or?). I am told that Volume III is in the works (in the botas even), and I can’t wait to see what Ramiro has in store, but for me the key argument has already been settled conclusively. Namely, if Jerez and Sanlucar are to regain the prominence they had, the historic soleras will not be enough on their own: the traditional virtues of terroir and winemaking have an important role to play. And if and when it does happen, we will all owe a big debt to Ramiro Ibañez.